Portadown interim manager Vinny Arkins. Pic by PressEye Ltd.
Portadown interim manager Vinny Arkins is searching for a tactical blueprint to blunt Crusaders’ attacking arsenal. 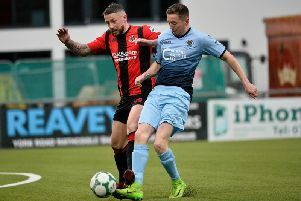 The defending Danske Bank Premiership champions arrive at Shamrock Park aiming to strengthen a pursuit of a third consecutive Irish League title. Arkins has helped lead the team to back-to-back on-field wins and a draw since securing the role of temporary manager in the aftermath of Pat McGibbon’s resignation. However, a visit by the league’s leading side offers a significantly-enhanced test compared to Ballinamallard United, Ards and Glentoran. Portadown’s Board of Directors have scheduled a meeting for early next week to discuss appointing a permanent replacement for McGibbon. Arkins is unable to take the role on a full-time basis due to his lack of UEFA A Licence qualification. However, the Ports’ all-time leading goalscorer remains with his focus on the football field. “They have real quality so we need to come up with a way to stop Crusaders’ threat from different areas,” said Arkins. “It is about going into the match without any pressure and to enjoy the challenge, especially with the backing of the home supporters behind us. “We have put some momentum together over the past few weeks and want to use that to try and stop Crusaders. “It is important not to make it easy for the Crues, they move it forward quickly and offer a threat from set-pieces but also open play. “We have to be clever and disciplined in our approach and not make it easy for Crusaders. Arkins has introduced a 3-5-2 formation since stepping into the hot-seat. However, Arkins is open to adapting the tactical set-up to expose or exploit any opponent’s gameplan. “We will look at everything over the course of this week and settle on an approach after training,” said Arkins. “It is not about formations as much as about individual players. Crusaders goalkeeper Sean O’Neill is keen to save the plaudits until the end of the season - despite a memorable individual week between the posts. O’Neill produced penalty saves against both Coleraine and Glenavon as the Crues recorded, respectively, a win and draw inside four days. However, O’Neill was quick to point out the importance of saving the celebrations and cheers until the business end of any campaign. “We know that you don’t get medals at this time of the year,” said the goalkeeper. “Sometimes you are the villain and the next week you are the hero.